Lay off the jugs and get Method | Do the twisted. Sometimes you just need to take a load off. Depending on how much you accumulate, it could be 3 or 4 loads before you know it. Laundry does build up fast doesn’t it? As if your dirty clothes from lord knows where you’ve been weren’t enough, there are also harmful chemicals and toxins in most laundry detergents. Now you might think, well if they clean my clothes, they’ll clean the earth! If that is the case, you deserve to be squirted in the eye with detergent, because that’s what we imagine it feels like when toxins permeate the oceans and soils. So what do we do about this? We buy Method Laundry Detergent. What’s rad about Method is it’s not your average scoop or pour laundry detergent. It is in fact a liquid pump. So no more messy blue bottles that makes it look like a smurf was murdered every time you do a load of wash. Poor Papa Smurf. You use only what you need. 4 pumps and you’re done. Just a warning, you might catch yourself wanting to keep pumping, but that’s just the jugs talking. 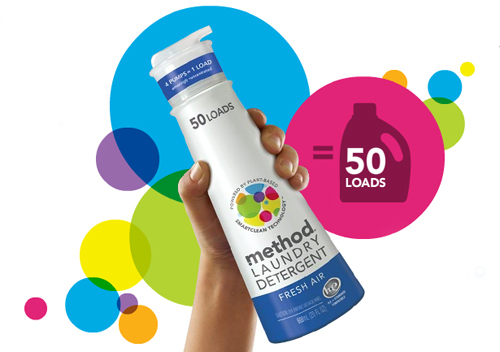 Thanks to Method, less detergent = cleaner clothes, happier earth. It is 2x smaller than regular detergents, using 36% less plastic and 33% less energy, thus making your feet smaller by providing you with 35% less of a carbon footprint. As for the detergent itself, it is nontoxic, biodegradable and made from 95% natural and renewable resources like plants. You’re smart. You’re clean. You’re green. So what are you waiting for? Roll in the mud and get dirty so you can get Method! You’ll have to pick up some Method. It’s crazy how small the bottle is in comparison to regular laundry detergents. Let us know what you think if you try it!